Martin Scorsesse has been terrific over the years. With movies like “Raging Bull”, “Goodfellas”, “Gangs Of New York”, and even the underrated “King Of Comedy” on his résumé, the man can be proud. “The Departed” won him his first oscar as a director, and let me just say: it was about time. With a cast that includes Jack Nickolson (as excellent as always), Matt Damon (in great form), Leonardo Dicaprio (who’s never been better) and Mark Wahlberg (in his oscar nominated performance), you know you’re in for a treat. I’ve watched “The Departed” 3 times since its release, and it gets better and better everytime I watch it. In south Boston, rookie cop Billy Costigan (Dicaprio) who grew up in crime is assigned to infiltrate the mob syndicate run by ruthless gangland Frank Costello (Nickolson). It’s his job to win Costello’s trust and help detective handlers bring him and his crew down. Meanwhile, special investigation unit officer Colin Sullivan (Damon) is earning everyone’s trust and rising to a position of power. Problem is: no one suspects that he’s in fact Costello’s mole. Violence and tension mount, as the character’s path intersect. 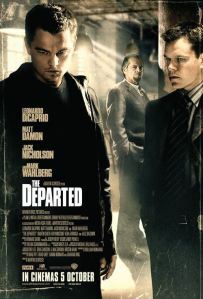 “The Departed” marked a triumphant return for Scorsesse, and became his best reviewed movie since “Goodfellas”; it’s certainly one his most violent, and (in my opinion) the best movie of the last decade. Nobody does it better than Scorsesse when it comes to crime pictures, and this time, it finally paid off.